You can learn the essential skills to enter the audio post-production industry. 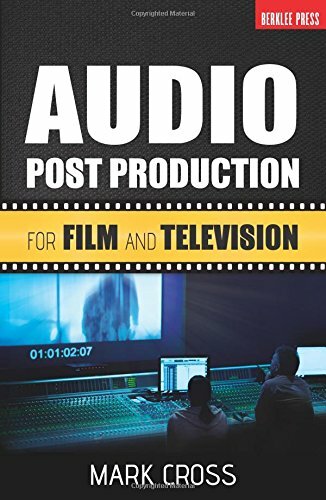 This book offers a broad coverage of audio post production, including the four basic elements: dialogue, music, sound effects, and Foley effects. You will learn strategies for working with composers, music supervisors, and dialogue and sound effect editors, and explore techniques on how to edit songs to fit a scene, record dialogue replacement, cue Foley effects for a scene, as well as many more. In addition, you will learn how to prepare for a pre-dub or temp mix (to group and sub-mix tracks into stems for the final dub), create the final dub, and prepare the mix for foreign distribution and final delivery. By learning the tools and strategies used by working professionals, you will have an advantage to participate effectively in this fast-paced environment, as well as applying these skills to independent projects. MARK CROSS is an award winning producer, composer, mixer, engineer, author, and educator with an extensive career in audio post production that spans over two decades. His credits include The Last Comic Standing, American Idol, The CBS Evening News, Wow Wow Wubbzy, Seinfeld, Curb Your Enthusiasm, Cars, ER, and many others. He teaches audio post production at Berklee College of Music's online continuing education division, Berkleemusic.